I am medically challenged too! To date, I have on Medik Awas 56 known drug allergies excluding adhesives. I am terribly allergic to 3M’s Primapore ( cannot miss it as it comes in a blue plastic reel bearing 3M trademark), plasters, rubber and could only use Tagaderm on selected sites. Selfix and Opsite on days I feel like tolerating too would be fun! Oh and get this…the reactions from drugs and plasters are difficulty to breathe, deep coma like sleep and horribly big blisters or hives respectively! Couple of days back, the vein that held my IV plug decided to get clotted. Hmm…a medical phenomenon I was told as it took the ruddy vein to get clotted some three weeks after the plug was removed. Dr Pang told me that if I became green lantern, I must then get worried, otherwise, it will turn from red as in inflamed to green, then to yellow before subsiding! He is just getting back at me with his brand of acerbic humor as I called him “Tonto” because I refused to call him BC as per his request as it stood for (to me) “Before Christ” and worst still it reminded me of a twit I once knew. Manipulative that other “BC” was. I was his underling and I was made to research and write his PhD dissertation then. I was unpaid, not given honorary one liner to be thanked for plus I was literally a ghost writer. I quit the job as this BC got a bit too much stalking me to the airport and waiting for me to disembark at Changi Airport from my trip home from Turkey to get me to write 3 chapters as his professor had brought the timeline forward when I was away on vacation. But I digress now. Back to my original blog topic haha! Doctors tend to take me for a test now and then. Just to prove me wrong. So much so, that they refuse to tell me what they did to me when I was deep in slumber under anesthesia only to wake up to realize two weeks later a red patch here or there only to be told by Dr James, “my bad, that would be me trying a new adhesive” He is absolutely devilish! But in truth, I know he has a kind heart as I am running out of drug and adhesive options. I made an awful mistake of downing 2 orange colored paracetamol called Pacofen. I did not read the fine print that it contained 8mg of codeine in each 500mg tablet. Two hours later, I was trying too hard to breathe. I went back to the blister pack and realized good gawd, codeine!! Luckily, I could let the drug wear off. Dr Pang was watching me via whats App ( darn this application is good man!) communication. Dr Pang opined the need for me to find and keep drugs. If codeine at its own 50mg dose, I would be dead! So, it found a spot in Medik Awas! I write in sharing with fellow bloggers who may have drug or adhesive allergies. It is important to write and describe the effects of the offending drug you have been exposed to. It helps during major surgeries and helps the medical team managed me during my stay in hospital each time. Prior to my neck an spine surgery ( yes, once upon a time in Singapore I was normal 😉 as in no aches or pains), the bed is my favorite lazy spot. 10 screws, plates, cages and rods later, I am no robo cop but a person who has to find a right sleeping posture as I wrestle pillows and plonk them on top of my mattress to sleep on. Hmm…it is tough to please both the neck and spine concurrently in a posture that I can sleep in. I will further have a talkative fun in his waiting area. Yes, his waiting area is almost like a fish market, always packed full with patients! Still I dread when night falls. It means I have to wrestle with my bed. Garfield usually sleeps with me. Thank goodness he is inanimate and is just my 20 year old stuffed toy. Sometimes he is used to support my neck. Yes, Garfield is cuddly wuddly soft. It is no fun being screwed up…literally I mean…nuts and bolts…I wonder how some people are smashed in accidents and have an entire verterbrate screwed up. I have always watched movies with surgical procedures and often hear the patient being advised to count from 1 to 10 whilst being put under general anesthesia. The patient then drifts into lala land after several counts. When it was my turn, this picture never played out. I distinctly remember being given diazepam before being wheeled into the operating theatre. At the entrance of the ward, I am already drowsy but lucid to hear the ward sister ask for my details and what is my procedure! I am then wheeled to the chopping block. I see my surgeons setting up their stereo set and my anesthesiologist finding a vein to commence work. In seconds he sets a plug and he then tells me let’s get ready. As soon as I see him injecting into my plug a milky white solution into my plug, it is lights out. I was robbed of my counting from 1 to 10. It was wham and bam instant knockout. I wake up not remembering anything except the dreaded beeping of the machine that controls IV saline and pethidine solution into my plug that directs to my vein! It only happens in the movies. Trust me, I have had more than a couple of major surgeries and my lights get turned off in an instant. Hmm or maybe it was because I was not gassed each time. Why Things Aren’t Hunky Dory? I am befuddled as to why I have the least confidence in myself when practically everyone I know, feels I am the most confident person they know. My Ex boyfriend once told me that I looked super confident even though I am lost. Yup! Mour as in yours truly, once led the way out of a building straight into a dead end! 😉 That’s how directionally challenged I am. Ha! Work issues are no issue. I usually achieve my goals with minimum cost. Sales Assistants on commission love me. Because when I shop, I would buy no less than 10 pieces of blouses and pants in under an hour! Cashiers are at their happiest as I am the first customer. You see, others have not riled them yet ha ha! I feel so like Julia Roberts in Pretty Woman except there is no Richard Gere waiting for me. I do not dress to the hilt. In fact, I dress like someone’s help. I am most comfortable in my worn t shirt, faded bermudas or jeans and raggedy shoes. That’s me..non pretentious! Small wonder when I stepped into the Mercedes showroom once, no one chose to serve me. They thought I was “hired help” who probably drove a master in a Lexus GS300 sports! I have since bought 3 Mercedes Benz cars. For the dumb twits that were on duty that fateful day some years back, they lost a prized low profile customer. I am amused. In Singapore, most of us lapse into Singlish and we often guffaw at new returnees! I am not confident. I just seem confident most times and I look intelligent even though I may not be intelligent. Strangest thing is people whom I have met recently keep telling me how I have touched people’s lives. Maybe I do. Maybe I don’t but I truly try. I enjoy helping people. I thrive on championing the rights of the less fortunate and believe strongly in equal opportunity. But most times I end up being hurt. I know George Orwell once said some are born more equal than others in Animal Farm…this is rather true. Helping the less equal is a must to me. I know what it was like to be struggling and getting to be where I am today. Hard work does not kill but working smart does as sadly I am no match for office politics. Duh! Cai Shen Ye or God of Wealth is an important deity for the Chinese Lunar New Year. I have seen many depictions of the God of Wealth, but this year I found this picture of him especially regal in its best artistic finery! His arrival symbolises wealth and good fortune for those you send too. So by sending this God of Wealth to people reading my blog…here’s blessing you with loads of wealth & umpteen tons of good fortune. The Horse is galloping in soon. In Singapore, the Horse year will be ushered in at about four and a half hours. I had reunion with my parents. We had chicken french poulet, roast duck, roasted char siew and fishball soup with black fungi and cabbage in pork stork. During dinner my sister phoned in from New Zealand to wish us Happy Lunar New Year. She had forgotten till I reminded her. She quickly cooked chicken schtinzel, salad, siew mai (pork dim sum) and har kao (prawn dumplings. My brother sent me a photo of his steam boat dinner with an assortment of shabu shabu pork and food to be cooked. As for me, I got tired easily as I realised I am still weak from surgery. 恭喜发财, 万事如意! 马上钱到! This means “happy new year to you, wishing you good wealth and everything you wish for materialises! James, my surgeon, has done a brilliant job fixing my spine, neck, stitching up my foot and re-sloughing my old ugly scar. He now wants to fix my spiritual limbo status. James is serving his reservist this week as a dutiful Singaporean. It seems he is part of the navy. His assistant surgeon whom I fondly nicknamed Tonto “app” me to say that James is having a “cho bo” time (“doing nothing much” in Hokkien ie under the guise of serving Singapore, he is technically very free!”) Ha! If James heard that, he would probably skin his assistant Tonto. Despite James saying that in the naval base, phone signals were phone, he still managed to reply me. Such is his committment to the Roman Catholic faith. He said I may be a lost sheep but Jesus would leave 99 sheep to fetch this lost sheep! I cited statistics and probabilities on his cocksure attitude to bring this lost sheep back to the fold. I told him I might just disappoint him as I am in spiritual limbo and probably will continue to stay there. His faith is so strong! He further adds he has enough faith for two of us. I admire his faith and tenacity to continue to convince me that 20 years of spiritual limbo is enough and that he is probably sent to guide this lost sheep home. My reply was that I was directionally challenged and that maybe I was meant to be in permanent spiritual limbo. I would be sad to burst his bubble. If he succeeds, then it is a miracle. If he fails, then I go deeper into my spiritual limbo. As a surgeon he fixed my physical well being. It would seem he saw my unwell spiritual being and is intent on fixing it too. Waiting For A Brain Wave To Blog…. My brain has been busy. Yup when the body is not as adept, my brain takes a leap forward! Yaay!! My blackberry pushed through work mails were a huge yawn as it is time for payroll authorization. I feel so powerful (“powderful” when pronounced Singlish style) as the bank dongles would permit me to “approve” people – lings of the company I work at ha ha…yes on a serious note, this is serious business as monies must be paid on time and accurately too! I have to ensure this as people’s mortgages and livelihood depends on this! Today’s newspaper topic centred on what our little red dot’s people will be in 50 years time. In a separate article by Chan Heng Chee, she opined that people will live longer as a result of better medical care. Gawd! I do not wish to be a 1,000 year old witch! Suffering from so many surgeries, I am sure the human body cannot live till 150 years or at least with quality of life and mobility! Given we are not a welfare state and if I lived to that old hag age….my savings would run dry! Young uns would baulk at old farts like me working as I impede their rise to the utopian kingdom of bosses! I will be hated. I will be a burden to society! But if I am a real tycoon, surrounded by mega wealth and a bevy of maids…hey I do not mind 😉 hmm…but like any mogul, I am sure to be faced with scheming relatives waiting for me to kick the bucket and bequeath my estate to their much needed yacht or champagne meals or lifestyle and caviar dreams! It was good catching up with K yesterday. During my health better days i.e. when my spine was in better performing days, I would spend weekends helping her bake cookies. Her baked pineapple tarts were excellent. Not sugary sweet and you could taste the tanginess of the pineapple jam. The photo above shows two type of cookies that K baked. The other shown is Cornflake cookies. Both have Malay origins…hmm cookie roots as you would say as Singapore was a Straits Settlement. The pineapple tart has also peranakan traits. Visitors are served cookies when doing Chinese New Year visitations. Each household will have a wide range of cookies or we call “kueh” in Malay. Although it may be the same type of Kueh Baulu, Kueh Bangkit, Kueh Tart or Egg Rolls….each will have its own unique flavor or taste as made or bought from different stores. I managed to catch up with my friend since we were 18 years of age today. She had kindly offered to help me get groceries. I am grateful to her as always for her thoughtfulness and kindness. She told me she was my personal assistant in hospital when I was being sent for CT scan and MRI. She had to re-direct my visitors and hospital personnel looking for me. She is a good person and I must add, a staunch Catholic. Yes, we used to go to church together till I ended up in spiritual limbo 20 years ago. I teased her that she has her antennae paired well with God’s bluetooth. All linkages were well connected with the best Heaven subscription for an internet plan. She does not get angry with my nonsense! Despite her busiest time of the year now…she has to cook for almost 18 persons plus a full time job, she makes time for me. Small wonder, I always call her “The Nun” as she is most giving. I often wondered why no man has won her heart as she is not only pretty, kind hearted, she is also a high flier in the corporate world. We are both single, career minded and with no Romeo in our lives! The reunion dinner is an important one for us Chinese. This is dinner where on the Chinese Lunar New Year eve, all family members return home to eat with their parents. Given today’s modern world, there is wide spread practice for married members to hold their own reunion dinner with their own family (nucleus). As many as 10 dishes are elaborately cooked; there will be duck, chicken, pork…loads of meats, traditional pen cai dishes, or steam boat meals, abalone, shellfish etc. this is a symbol of prosperity feasting as family members eat and make merry ushering in the new year. Sometimes up to 3 generations eat together. Child, parents, grandparents! Luckier ones would have even their great grandparents to share reunion dinner with. For me reunion dinner reminds me of the night my granny died. I remembered my mum had just finished cooking a sumptuous meal and just as we were about to say grace and begin dinner, uncle arrived at our house to announce Granny’s passing! I must have been 6 years old. So I cannot help but remember granny on reunion dinner night. Granny doted on my mum and my mum dotes on me as she does with all her children! I also remember my pet Doberman, Gretchen. She was like a family member and would always have a piece of what is served at reunion meals. Gretchen lived up to a ripe age of 13 years or 91 dog years! Reunion is special as families gather to remember the past, rejoice in the new year ahead and just yakkity yak with family. 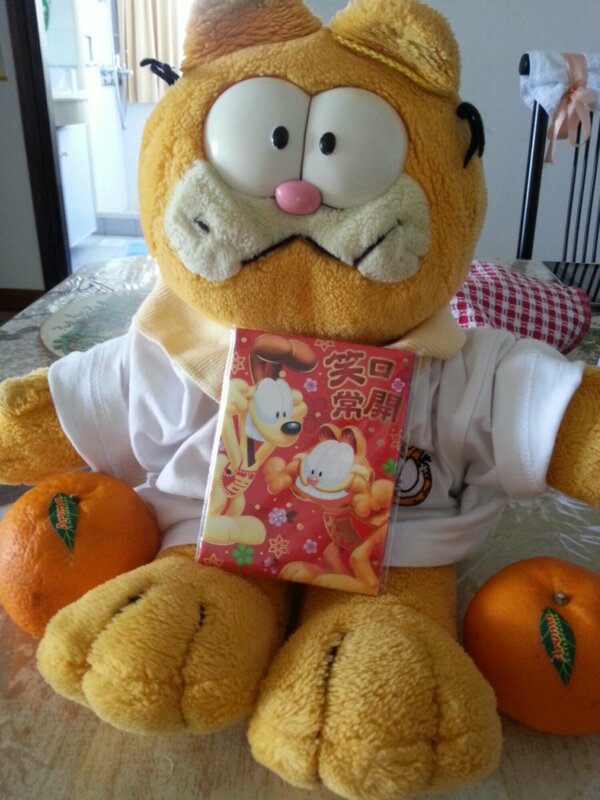 It will be just a quiet simple meal with my mum and dad and my favorite stuff toy, Garfield….happy feasting all and remember your loved ones during this day! 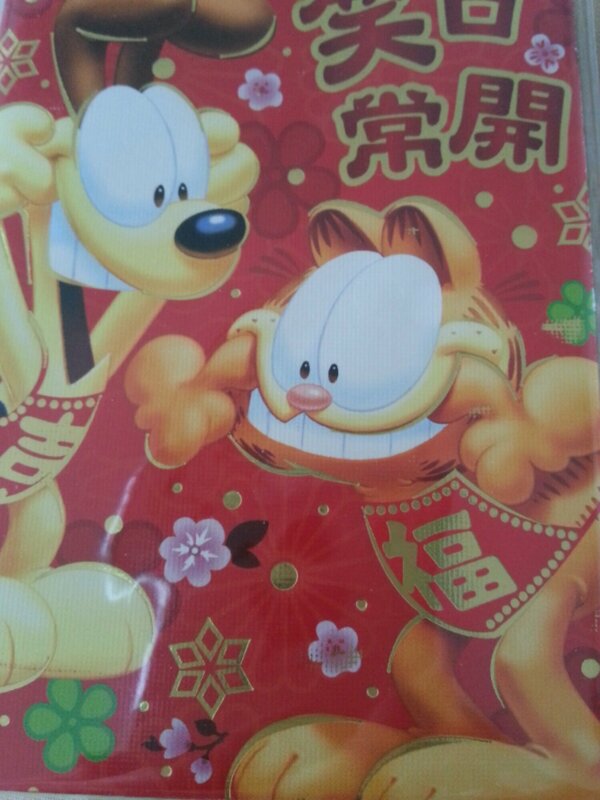 Xin nian kuai le wan shi ruyi or as we say in Hokkien…hhhhhhuuuuuaaaat aaah! This means….prosper and make it rich!!! I confess I am a neat freak! I like things to be returned to its original location once used and after use. There is a spot for everything in my apartment. I can hear her voice ringing…pick up your toys…put them back….stack your books….hmm…again I am glad I am not married as my Ex was such a pig sty! Honestly he disrobes as he walks and clothing has to be picked up after him. Thank goodness he is now married to his bimbo and have 2 maids to wait on him. I shuddered thinking I almost became his life long maid not mate ha ha ha! My current medical condition has reduced my apartment to a squatter’s shack I tell you. As a result of my surgery, I am not to bend, stoop or reach up to get things. My spine is so fragile at this stage as I am at the mark where bone dies and the screws in my spine are at its most precarious stage till inflammation of the bone sets in and bone is formed to fuse bone with screws! As for my dining table and side board cabinet, all my edible munchies such as cereals, oats, cookies and other tummy whatchamacallits are happily displayed and stacked. I feel as if I am Jones the Grocer or in American, your regular Ma and Pa grocery shop. In our colloquial slang, it is a provision shop or “chap Huay Tiam” or “MaMa Shop”! !